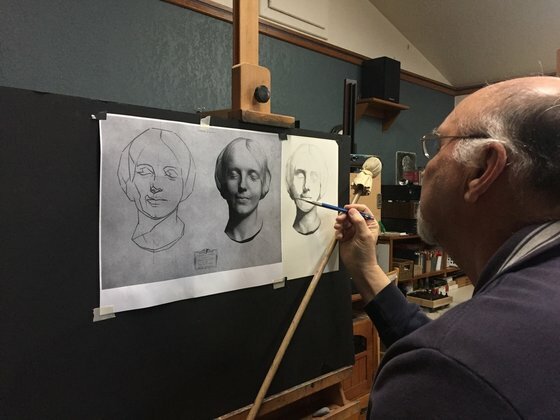 Academic drawing and painting in the classical tradition requires diligent, systematic and consistent training. The Adult/Teen Atelier curriculum at The Conservatory for Classical Art is based upon the traditional, time-tested practice of observing nature and the masterful translation thereof. ​Follow the link to learn about KIANA DANESHMAND. Two year program of oil painting study, after completion of the drawing program and Oil Painting & Color Science Course. Fourth year students will prepare and work on carefully designed projects with the aim at producing a portfolio for the purpose of scholarships, applications to professional academies, ateliers or university. 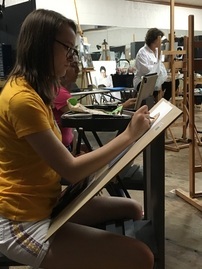 Students may choose their course of study or specialty during this last year, whether it is drawing, painting or sculpture. Much of the work is individual studio projects with advice and critique from the faculty. In order to receive the benefit of the CCA atelier program, students are encouraged to commit to, at the very least 12 hours in studio per month. Students attend Thursday scheduled sessions for instruction and studio time. For students enrolled in the full-time Atelier Program (12 hrs per month) additional independent studio time is encouraged. Please check with Kiana for details. ••Tuition is due on the first day of each month. A $15 late fee applies to payments made on or after the 6th day of the month. A 3 month commitment is required for all atelier programs with 1 month notice of cancellation. When enrolling in an atelier program or class at CCA, you agree to our terms and payment policies. Thursday, 1 - 4 p.m. Please contact Kiana to reserve a space if you have to miss you regularly scheduled session. Attend Open Studio with a live model. This is a free 3 hour uninstructed studio session. However, there is a $10 model share fee and you must reserve your place in advance.